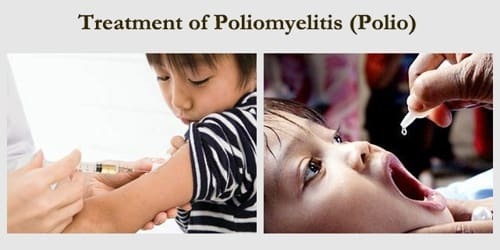 Definition: Poliomyelitis, also known as polio and infantile paralysis, is a highly contagious viral infection that can lead to paralysis, breathing problems, or even death. In about 0.5 percent of cases, there is muscle weakness resulting in an inability to move. This can occur over a few hours to a few days. 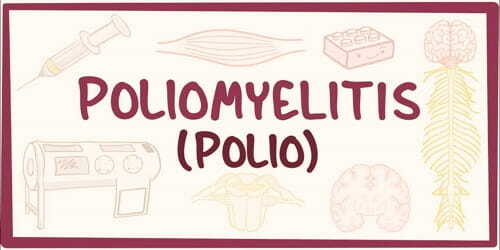 According to the World Health Organization (WHO), 1 in 200 polio infections will result in permanent paralysis. Polio has been eradicated in every country of the world except for Nigeria, Pakistan, and Afghanistan. Polio mainly affects children younger than 5. However, anyone who hasn’t been vaccinated is at risk of developing the disease. Paralytic polio can lead to temporary or permanent muscle paralysis, disability, bone deformities, and death. The disease may be diagnosed by finding the virus in the feces or detecting antibodies against it in the blood. The disease only occurs naturally in humans. The disease is preventable with the polio vaccine; however, multiple doses are required for it to be effective. 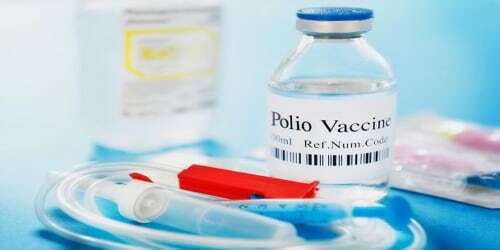 Polio Vaccine: Two types of vaccine are used throughout the world to combat polio. Both types induce immunity to polio, efficiently blocking person-to-person transmission of wild poliovirus, thereby protecting both individual vaccine recipients and the wider community (so-called herd immunity). Inactivated poliovirus (IPV) – IPV consists of a series of injections that start 2 months after birth and continue until the child is 4 to 6 years old. This version of the vaccine is provided to most children in the U.S. The vaccine is made from inactive poliovirus. It is very safe and effective and cannot cause polio. Oral polio vaccine (OPV) – OPV is created from a weakened form of poliovirus. This version is the vaccine of choice in many countries because it is low cost, easy to administer, and gives an excellent level of immunity. However, in very rare cases, OPV has been known to revert to a dangerous form of poliovirus, which is able to cause paralysis. Diagnosis and Treatment: The doctor will diagnose polio by looking at the patient’s symptoms. They’ll perform a physical examination and look for impaired reflexes, back and neck stiffness, or difficulty lifting their head while lying flat. A laboratory diagnosis is usually made based on recovery of poliovirus from a stool sample or a swab of the pharynx. Antibodies to poliovirus can be diagnostic and are generally detected in the blood of infected patients early in the course of infection. Analysis of the patient’s cerebrospinal fluid (CSF), which is collected by a lumbar puncture (“spinal tap”), reveals an increased number of white blood cells (primarily lymphocytes) and a mildly elevated protein level. Detection of virus in the CSF is diagnostic of paralytic polio but rarely occurs. Today, many polio survivors with permanent respiratory paralysis use modern jacket-type negative-pressure ventilators worn over the chest and abdomen. Other historical treatments for polio include hydrotherapy, electrotherapy, massage, and passive motion exercises, and surgical treatments, such as tendon lengthening and nerve grafting. Prevention: The best way to prevent polio is to get the vaccination. The US Centers for Disease Control and Prevention recommends polio vaccination boosters for travelers and those who live in countries where the disease is occurring. Once infected there is no specific treatment. Be sure to receive a vaccination before traveling to an area that is prone to polio breakouts.